If you search for green building devices on the internet, you will find a tremendous number of links for “gizmo green” gadgets. These are generally technology-based items that you can install in or on your existing home or entire systems used to build new “green” houses. While we applaud the changing mindset that takes sustainability into consideration, the public is constantly misinformed by manufacturers about the true green and sustainable value of many of these products, touting items that will end up in landfills several years down the road as they break down or become technologically obsolete. The practice is common enough to have garnered the term “greenwashing“. As a result, we don’t jump on the bandwagon of promoting many of these technology driven devices, with the exception of a few items such as instant hot water heaters, solar attic fans, energy efficient appliances and programmable thermostats that we feel have earned their place in our own projects. 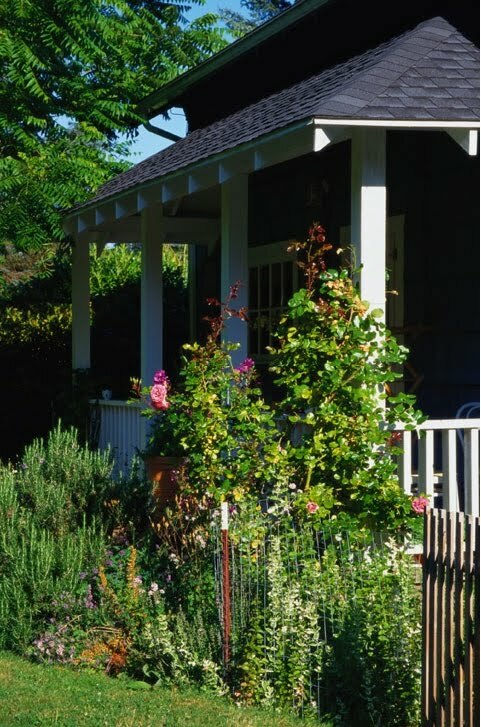 Being proponents of historic homes and traditional design in general, we instead choose a more tried and true method for living sustainably for our Favorite Green Building Device: the Porch. No manufacturer is out promoting the simple and attractive traditional shaded porch, so it does not get its fair share of green building credit, but porches can have such an impact on building energy savings (particularly here in Florida) that it amazes me whenever a new building publicized as “green” but has no porch shading any facade (but preferably the south) implemented into the design. Porches have been employed by generations to provide a cool space to sit out on hot days, capture breezes and shading the building interior. They are considered a passive solar technique; they require no additional energy input to operate but can cut cooling costs tremendously by reducing heat gain in the building interior. In addition, porches (when constructed properly) are easy to maintain, never become obsolete and enhance the architecture of your home as an added bonus. Other traditional Florida building techniques also come in a runner-ups in our list of Favorite Green Building Devices: operable window and doors with screens, wide overhanging eaves, and high ceilings.